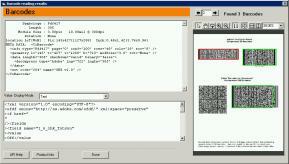 Barcode scanner software to process PDF, TIFF, JPEG images from scanner, fax, camera. Read 1D barcodes (such as Code 39, Code 128, etc.) and 2D barcode: PDF417, DataMatrix, and QR code. Inlite's Targeted Barcode Reader (TBR) technology addresses exceptional requirements for barcode recognition, validation and formatting. TBR allows Inlite to apply its technical expertise to deliver custom solution as rapidly and cost effectively as an off-the-shelf product. Maximize the usability of the barcode data and simplify application development. ClearImage reader automatically identifies the appropriate data presentation and provides it to the application. Automatically decompresses barcodes from Adobe® LiveCycle® forms. 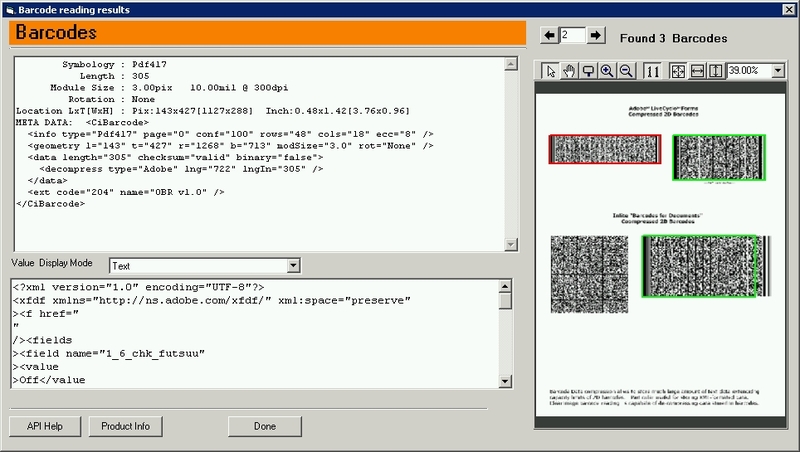 Consolidates multiple 2D barcodes using structured append (including MacroPDF47) into a single barcode data. API: COM, .NET and Java. DLL for OEM projects. Projects: 32-bit or 64-bit or AnyCPU. Languages: C#, VB, Java, C++, VB6, Delphi, PHP, VBScript, Java Script, Python, Perl, Ruby etc. The sample projects in the ClearImage SDK: Visual Studio C#, VB, C++, VB6 or Eclipse Java. Intuitive API requires no knowledge of barcodes or imaging. No obscure parameters to specify. Multiple recognition algorithms compensate for damages introduced during document handling and scanning/faxing. Engine takes full advantage of grayscale and color scanning. Inlite's design methodology is a continuous algorithm improvement toward 100% recognition rate of customer images. Why choose Inlite for your imaging technology? Continuing algorithm improvements deliver up to date, reliable technology. Insiders Technologies is a leading European software company in the field of input management. Since many years the company has integrated the 1D and 2D Barcode Recognition engines from Inlite Research for its workflow purposes. ClearImage was selected because of its excellent performance with the whole spectrum of images. The software integrated quickly into each of Insiders' document analysis solutions with no issues. During the successful years of past cooperation, Inlite provided Insiders with numerous updates, for example responding to windows upgrades that have occurred. Today globally operating, market leading corporations and major customers of all industries rely on the intelligent products and solutions. Despite a 9 hour time difference, whenever questions arise, Inlite responds within a day, or even on the same day. Together we support some of the largest insurance providers in Europe. Inlite have been terrific to work with - their product stood out compared to other similar products, and their proactive nature and willingness to help us go live has been first class. Thanks for an excellent, professional, experience! Falcon Global originally assessed a number of bar code products. ClearImage was selected because it was easy to build into a product and was well documented and superbly supported. Selection of ClearImage has proved to be an excellent decision. ClearImage, being very reliable, is an integral part of the Zenator success story. Zenator, widely used in Oil and Gas construction projects all over the world, processes millions of documents each having a bar code. PrimeSoft's V-Desk system offers our customers combined functionality of the Document Management System (DMS), Document Circulation System (workflow) and Archiving System. We have been using Inlite's ClearImage Barcode 1D Pro since 2004. ClearImage is easy to integrate, easy to install, and provides extremely reliable barcode recognition in a high volume production environment. Inlite's support staff consistently demonstrated high professionalism. I have no reservations in strongly recommending Inlite as a future professional partner. Maxrecall an Enterprise Document Management Software company is grateful to Inlite research for coming to our rescue. We had a solution for one of our clients that was not acceptable in terms of performance, accuracy reading the barcodes they produce on their documents. Maxrecall needed and found in the ClearImage Barcode product the solution. The ClearImage barcode reader not only out performed our present product but was extremely easy to integrate as well as giving us more options and features during the processing of the documents. Inlite's Barcode Recognition Software has been a critical part of our Chrome River EXPENSE and Chrome River INVOICE products. The barcode recognition is extremely accurate and efficient. On occasion, when a barcode can not be read (ex: too much coffee spilt on the barcode), Inlite's support team figures out what the issue is and creates an add on module for us. All this analysis and resolution happens in record time. To say the least, we've been very pleased with the product! Thanks to ClearImage Barcode 1D, we scan and electronically file many hundreds of documents each day in a small fraction of the time that it used to take to file them as paper. The result is not only a huge savings in time and energy, and therefore cost, but also filing errors and lost documents are practically eliminated. They are now available everywhere in the company, instantly, and can be effortlessly e-mailed, faxed, and even archived in seconds. ClearImage Barcode is a WONDERFUL product! Through your support and examples, I developed, in about 2 weeks, a compact and efficient document scanning and storage system for our company that would have cost many thousands of dollars to purchase. Inlite's ClearImage Barcode SDK is very straight forward to install, clearly understandable in its application and usage and from my research is pretty much unequaled for the price. To determine which product you need, see ClearImage Barcode Readers Comparison or contact Inlite sales. Please note the license requirements and purchase details below. Server Licenses can be operated on any Windows physical or virtual computer. Workstation Licenses are intended for Windows 7, 8, 10 running on one computer; they are limited to 25 pages per minute. Unlimited pages per minute require the Server License. Operating Workstation License on a Windows Server, VM or Cloud VM processing will limit processing to 5 pages per minute.